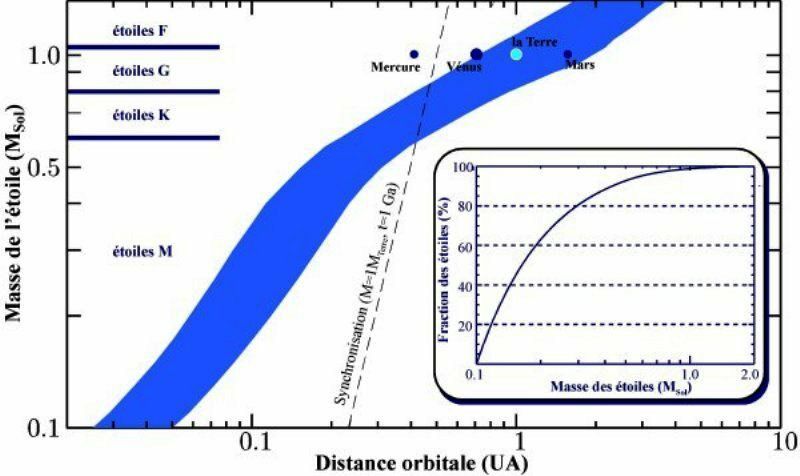 The habitable zone (HZ) around a star was defined by Hart (1979) as the region wherewater can exist in liquid state at the surface of an exoplanet. In other words, it is the circumstellar region (region around a star) where the mean temperature at the surface of the exoplanet is higher than 0°C but sufficiently low for the water to remain in the liquid state. However, this definition should not hide the fact that if the surface temperature of a planet depends on the properties of the light energy produced by the host star (and of course the distance to the star), it also depends on the radiative properties of its atmosphere or its surface, and especially the planet's greenhouse effect and albedo. For a planet to be habitable, the stability and eccentricity of the exoplanet's orbit must also be taken into account as they may be such that the planet is not permanently in a habitable zone. In the case of red dwarfs, an extra complication comes from the stems that the HZ is so close to the star that synchronous rotation of the exoplanet can be established. The planet will then always have the same side facing the Sun. The notion of a continuously habitable zone can be introduced, where the variations in the brightness of the star throughout its life are taken into account.